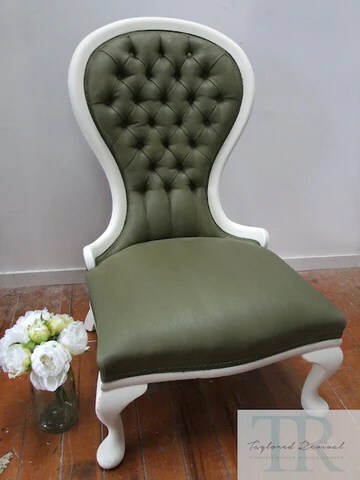 We had this chair in progress during our second paint workshop and there has been alot of interest in how to paint upholstery and obviously the results. For some the idea of painting upholstery is a bit of a shock; but what you are actually doing is dying the fabric whilst in chair form. There are alot of beautiful chairs in homes where the springs are intact, the piping is perfectly in place and other than the dated textile everything else is in good order. To take it to a good upholsterer will cost you a reasonable amount to replace perfectly good fabric however now there is a choice. As you can see a great way to update and create the look and colour you desire is with Chalk Paint™ by Annie Sloan. Here is a quick example of one we did for our client. 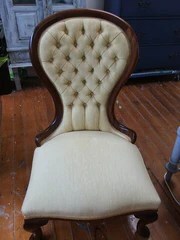 This is the chair in its original form. 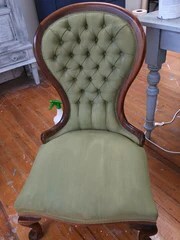 Beautiful solid chair with plenty of character but it no longer fitted into our clients room. We drew inspiration from a set of prints that it normally sits under and decided to pull the greens from that print onto the fabric by using Olive and lightening the frame in keeping with the white themed room. First we used a spray bottle filled it water and misted over the fabric, not to drench it but a good healthy mist over the areas we were going to paint. working our way in sections. 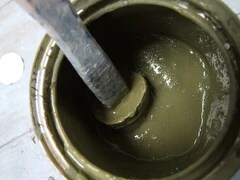 Next we mixed up a mixture of 1:1 ratio of water and Olive paint, making it a very runny mixture. 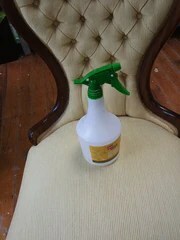 Thus we mixed up a total of two batches of 300ml Olive and 300ml Water for this chair. We didn’t mask the wood, as the mixture is a runny one, if we got any on it we just wiped with a cloth along the way…a day that requires with no masking is a good one! 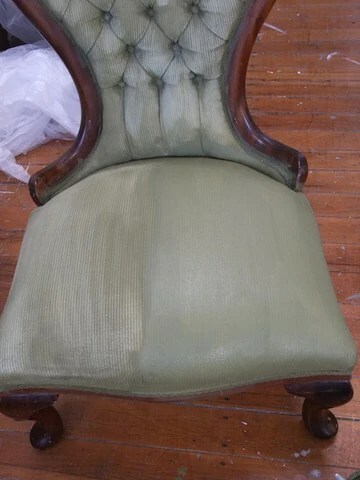 This is the chair after the first coat; already such a change and look at the excellent coverage, pretty exciting! about here its time for that big cup of tea we keep talking about :-). We left this to completely dry for 24 hours before we applied the second coat. We only misted the fabric on the first coat to get the paint mixture onto it smoothly with the second and third coat it was just a matter of painting the mixture over the textile and slowly deepening and covering all the little bits and pieces evenly then leaving to dry 24 hours between coats. 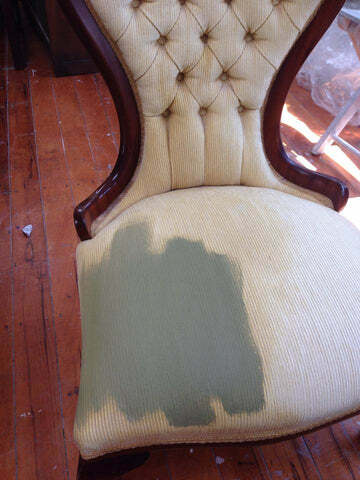 Then we lightly sanded the upholstery using a very fine grit sandpaper… yes thats right, sand the upholstery, especially on any areas where there was paint build up or “uneven-ness” With this one we used 240 sand paper and just lightly sanded over. We then mixed 1:1 clear wax and meths and stirred it together which created a runnier wax. Using a brush we applied the wax on and then wiping any excess off with a lint free rag. As you apply the wax you will see your sand marks disappearing, and the richness of the colour coming through. 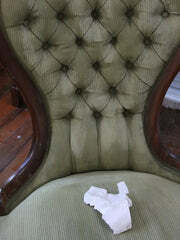 We waxed the entire chair rubbing it in with a brush and removing excess wax with a cloth and then buffed it slightly,. We then left it to “set” overnight before one final layer of the mixed wax, wiped the excess off and gave it a final buff.